← H. P. Lovecraft’s, “The Unnamable” – Performed Live, in a Dead Place! October 21-31, 2010. I have already recorded the first five chapters, but I’ll then work on each of the final seven chapters one-at-a-time. I researched the name, “Pabodie”, for pronunciation; and once I found it was a variant of “Peabody,” and “Paybody,” it was easy to settle on, “Pay-Body” as the choice for my reading. And, there is one point in the text where the sources disagreed on whether the word, “Probably,” or the word, “Probable” should be used; and I had to believe that William Dyer, the man telling his story, would not have been guessing with “Probably,” and would have meant, “Probable” instead. So that was my choice for this reading too. Chapter Two is coming soon! Love it, Will! Thank you. Acho que precisamos dessas ‘iniciativas’, embora não seja a melhor palavra. Também gostei da ideia de tentar entender o significado do nome “Pabodie” utilizado por Lovecraft – meu mestre na escrita. Utilizo um tradutor virtual e envio esta missiva em português também. I think we need these ‘initiatives’, although not the best word. I liked the idea of trying to understand the meaning of “Pabodie” used by Lovecraft – my teacher in writing. I use a translator and virtual sending this letter in Portuguese as well. That was really great! I can’t wait for the next chapter. Please keep up the good work. I am really enjoying your reading; what a great project to undertake! Thanks so much for sharing this with us. Nice chapter one, and great site on Lovecraft… I think you’ll like the following info about the audio book and the film…. Through the last couple years of struggle with Universal, anger over potential R ratings, 150 million dollar proposed budgets and A-list actors “attached” who never even heard of the deal… Obviously, Del Toro and Cameron were faking us all out and hoping to fake out Universal, too… Cruise was never attached, either. It seems this was a project that had no chance of success. But now that Del Toro and Cameron are gone from At The Mountains Of Madness, Mihai and Sparks are making the H.P. Lovecraft film adaptation. The Producing-directing team of Carrie Cain Sparks and Shadow Mihai – shadowmihai.com have announced they have begun pre-production on an original feature film adaptation of H.P. Lovecraft’s At The Mountains Of Madness. 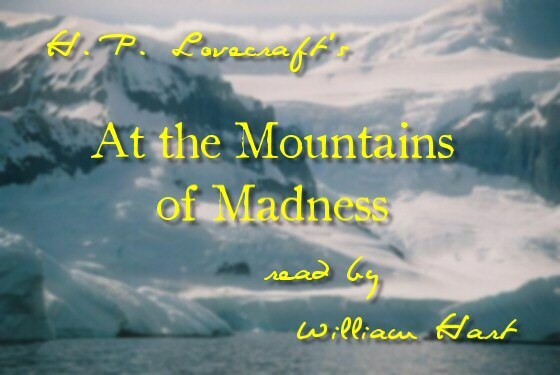 As a precursor to their film, they last week released the sjLume.com audio book version of Lovecraft’s At The Mountains Of Madness along with a companion e-book version in various electronic formats. The audio book was directed by Shadow Mihai. I haven’t seen the script (they won’t let a stumbler like me near it with a 30 foot word processor) but Director Mihai, who wrote the script for the new adaptation, insists that there is plenty of theme based faithfully on the original Lovecraft work, and several unconventional storytelling angles that are compelling and unusual. Sparks and Mihai say that the production values will be similar to the intended Del Toro work. They will shoot live action and in the 3D format. So many of us Lovecraft fans and horror fans (and fans of 3D film) were let down when Del Toro dropped At The Mountains Of Madness. But Mihai and Sparks intend to produce the film out of their own company, Stella James Studios. A start date for the historic film is supposed to be announced this week on sjLume.com. I immediately thought of “That is not dead which can eternal lie, and with strange aeons even death may die” when I heard it. I think they copied it enough for us to at least notice it.